Pallbearers carry the casket of the Rev. Billy Graham past family members as it returns to the Billy Graham Library in Charlotte, N.C., March 1, 2018. The Rev. Billy Graham's five adult children and some of his favorite singers were preparing to offer memories, hymns and prayers at a funeral Friday that marks the culmination of more than a week of tributes to "America's Pastor." Mourners were already taking their seats hours before the scheduled noon start time of the service in a tent on the grounds of Graham's library in Charlotte. The invitation-only crowd of about 2,000 is expected to include President Donald Trump and Vice President Mike Pence. The service will also be streamed live online. Neither Pence nor Trump are scheduled to speak during the service, but they are meeting privately with the family beforehand. The Rev. Franklin Graham will deliver the main funeral address for his father after shorter messages from Billy Graham's three daughters and younger son. 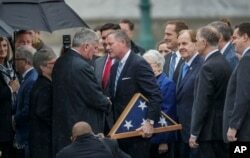 Sen. Richard Burr, R-N.C., holding the flag, reaches out to shake hands with Rev. Franklin Graham, the son of the late Rev. Billy Graham, on the East Front of the U.S. Capitol in Washington. The funeral planning began a decade ago with Billy Graham himself, and it also reflects his family's desire to capture the feeling of the crusades that made the world's best-known Protestant preacher of his era. Other notable guests are expected to include North Carolina Gov. Roy Cooper. His immediate predecessor, Pat McCrory, was already in the tent hours before the service and doing commentary for a radio station. The funeral serves as the culmination of more than a week of tributes that included crowds lining the road for a procession from his home in the mountains to Charlotte, where Graham grew up. Approximately 13,000 people - including former presidents George W. Bush and Bill Clinton - filed past his casket during a public viewing in Charlotte this week. And on Wednesday, Graham became the first private citizen since civil rights icon Rosa Parks in 2005 to lie in honor at the Capitol Rotunda in Washington.